'Pets' is a plugin to help you manage your cosmetic pets. You can search and scroll through the list of available pets to obtain in the game, find out information about how to get the necessary tome to learn the pet skill, and add your favorite pets to a specific quickslot bar for easy access. On loading, a new icon will appear on screen. This can be moved about by clicking and dragging. A single click will open the quickslot bar and a double click will open the main window. The pets are organised into families to make them easier to find, and are sorted alphabetically. This applies also to pets that are added to the quickslot bar. 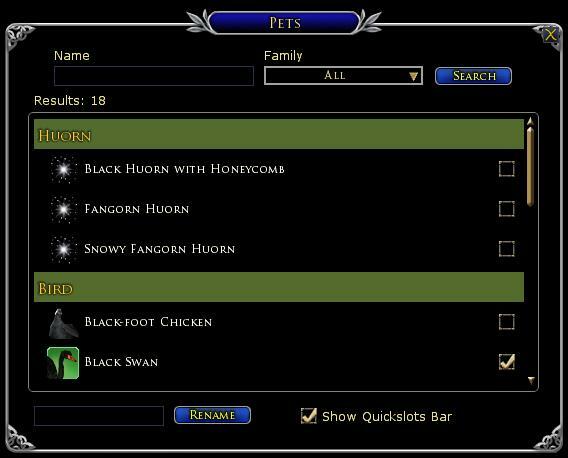 For each pet in the main window, checking the box next to the pet name will add that pet to the quickslots. Clicking the pet name opens a short description of where you can get the pet from, and the tome that is needed (should you want to link it to chat as a WTB etc.). At the bottom of the main window you have a text box which you can enter a new name for your pet. And the option to show/hide the quickslot bar how ever you prefer. /pets - shows/hides the main window (incase you have the quickslots disabled). At present the plugin is only available in English and German, however translations into French and Russian are possible with separate string files included. German translations by DaBear78. I also want to give a huge thank you and shout out to Sucamarto, Xanthor, Grizzly UK and Garan for sharing the new data as it is discovered. - Fixed an issue preventing the rename button from working. - Changed the search text to also search descriptions as well as pet names. - Added a new dropdown so you can also search through the pets added from each update. - Fixed an issue with the Little Mûmak which now shows up as Little Mûmak (raid reward) and Shobdo the Little Mûmak (store purchase). - Removed the duplicate Hallows-eve Kite. Yeah I do all that and nothing ! It won't work unless it comes from the compendium. I can try again I have no idea what the issue is, but everyone I know had the same issue that is why we got the compendium in the first place. I will look and see again. Hello, i saw you were busy, so i uploaded the patch with newer Pets. I hope you dont mind and i plan to update it until you are ready to make official update. I just found i forgot to copy the last 2 festival pets into translations, if you are using other than English game client maybe that was the problem, will fix that now. No sorry for being busy with life !!!! Like I said I have no luck with the other ones, I will just wait for the update when you have time! I love it enough to wait, I collect pets so it is nice to be able to have that and actually use them! Without them cluttering up bars or having to scroll through them all so I have nice set of stuff checked on your plugin. Thank you again for it ! This is not updating on there anymore? That is the only way I have been able to get the plugins to work is through that, well not just me everyone I know who plays. Anyway, long story short I LOVE this plugin and was sad when I thought you had stopped updating it. I was looking for a new one to maybe replace it and I see you have been updating it but I am not able to get them? Am I doing something wrong? Everything is up to date on compendium, and yes I know how the files work and to install them etc. I am clearly missing something though! Sorry I've not had time to look at any of my plugins for a few months. I am so stretched with work at the moment it's crazy. There have been some addons which include the latest updates which you can download here and install, but as they aren't official updates I don't think Compendium will recognise them. So probably they have to be manually installed. As soon as I get a day free I will get to updating the official plugin, but I don't know when that will be. Thank you for using Pets, and sorry again for being so useless. That's odd, unless I left a step out of my description, because I've been using my own for about two years now, doing exactly this, with five separate plugins: mounts, travel skills, LM combat pets, Captain pets, and startup skills - with zero problems. so far i got only to building the database, but its clear there will need to be some changes. Btw, one thing i dont really understand; why do people use these plugins? you can browse collections (Ctrl+C) or skill panel (k). Unfortunately, this is not how it works. You will encounter more problems that need to be solved. About 18 months ago I asked if anyone knew of an addon like Pets but for mounts but never received a reply! I have looked but sadly I haven't been able to find anything like a mounts version of Pets. Provided that Galuhad doesn't mind people using his code, it's not incredibly difficult to make a mounts plugin like this one. The real "difficulty" comes with getting all the reference codes for the billion and a half horses and ponies in-game. It's tedious and time consuming. When whomever does the new yule pets, don't forget the not-so grim snowman from the festivity dealer. This is a great resource, especially for people like me who are constantly forgetting the shortcut to get to the pets area in the lotro normal interface. I do not like using Tonic Bars, so I was wondering if it would be possible for you to make a similar plug-in to this Pet one but for the game mounts? There are some I use all the time and hate having to go into my skills area to get them, so normally put them on my bars, but that takes up room needed for other things, so a mount plug-in like this Pet one would be fantastic! Last edited by Grizzly UK : 12-19-2018 at 01:59 PM. Last edited by Xanthor : 12-04-2018 at 02:21 PM. PS: Is there a set number of pets allowed? Like somewhere there is a program file that sets the number of pets to like 140 total (and needs to be changed)? Last edited by 4andreas : 11-28-2018 at 03:13 AM.